We're committed to making recruiting better. 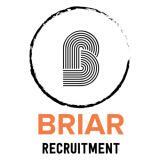 We know at Briar Recruitment we stand out, our team is made up of a dynamic group that combines experience from varying industries. Recruiting experience? How does, "since 1993" sound? We also have expertise in automotive, oil & gas, technology, retail, design, marketing...how many do you want us to list? Rest assured, you can be confident that we have a depth of understanding into human capital and what qualifications, skills and experience make a great candidate.Briar Recruitment understands your needs and is ready to go to work for you. Whether you're looking for your next employee or looking for your next career, you can trust that you're in good hands.